By David McDonald, M.D., Emily Janitz, D.O. 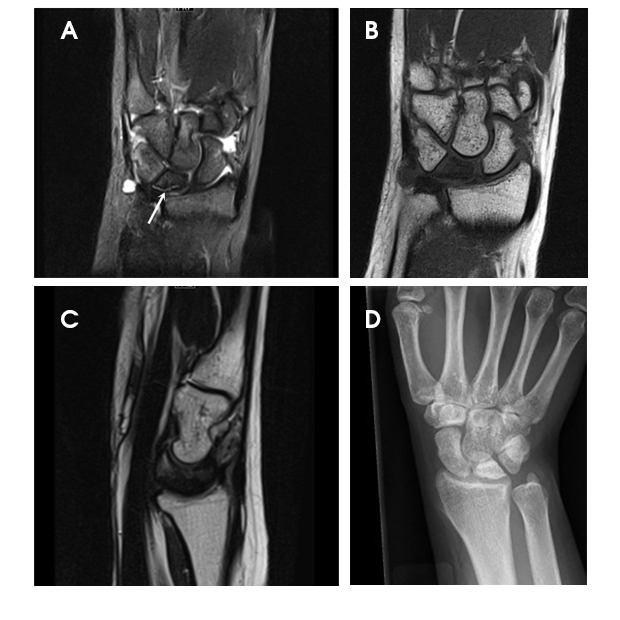 A 16-year-old girl with right wrist pain for several months and new onset wrist swelling was referred for MRI. STIR coronal (A), T1 coronal (B), and T2 sagittal (C) MR images demonstrated diffuse abnormal marrow signal intensity throughout the lunate due to lunate sclerosis. A subchondral fracture line (A, arrow) and early lunate collapse was noted, consistent with avascular necrosis (Kienböck’s disease). Radiograph (D) confirmed lunate sclerosis and early collapse. Diagnosis of Kienböck’s disease is classically made by plain film with 4 stages identified: (I) normal radiographs, (II) sclerotic changes with normal morphology, (III) lunate collapse, and (IV) radiocarpal or midcarpal degenerative arthritis.2 Stage I is usually suspected clinically and diagnosed with marrow signal changes on MRI, while stages II-IV are generally diagnosed by plain films with MRI and computed tomography (CT) being complementary. Treatment varies based on staging and clinical factors; no single surgical approach is unanimous. Arnaiz J, Piedra T, Cerezal L et al. Imaging of Kienböck Disease. Am J Roentgenol 2014;203(1):131-139. Lichtman DM, Lesley NE, Simmons SP. The classification and treatment of Kienböck’s disease: the state of the art and a look at the future. J Hand Surg Eur 2010;35(7):549-554. McDonald D, Janitz E. At the Viewbox: Kienböck’s Disease. J Am Osteopath Coll Radiol. 2016;5(1):30. David McDonald, M.D., Emily Janitz, D.O. Dr. McDonald and Dr. Janitz work with the Department of Radiology, Akron Children’s Hospital, Akron, OH.